Okay! Musume Time: Who Are Starmarie? All links relevant, and also related, to this post will be added at the end of the post. Be sure to check out the links if they look interesting! It has been a while since I last profiled a group and introduced you guys to someone new, and with recent happenings on both Idolminded and Pure Idol Heart, I thought that it would be pretty good to take a look at a certain group who are certainly worth the mention. Say hello to Starmarie! Created back in July 2008, this group has certainly been around for quite some time, however since their creation, the group itself has had a few changes in terms of members. Right now, however, the group seems to be going strong with just the three of them. With a concept of 'Fantasy' and 'Telling wondrous stories to their fans through songs', Starmarie have become a strong and capable unit with determination, and a pretty big goal they hope to achieve, too. Like most Indies groups, there is only a little information on the group out there, however from what I do know these girls have been far from idle in the Idol realm. They have been performing since they began, have released seven singles, as well as two albums, and have also been a part of the Indies Idol collaboration group ALLOVER where Starmarie were a part of Team-α from April 2012 until March of this year. More recently, however, Starmarie have begun their expansion into the American market... actually, this expansion started back in 2012, but has recently started to develop further. ... Pretty damn cool, huh? Since the groups expansion towards the English-speaking market, the group now have an English Facebook page, their official website caters to both English and Japanese speaking fans, and their youtube now caters to both Japanese and English fans. What's more, the group itself are also adding their new songs to iTunes for American fans, and are also performing at Anime Expo in Los Angeles! The girls are fast moving forward with their expansion into America, and it looks like they won't stop going forward with their goal! Looking at Starmarie, the group itself really seems to be heading forward and making themselves known. They are a small group, but they have a certain determination and stamina that is extremely refreshing for an Idol unit; these girls, whilst they may not have a crazy amount of fans like other groups, certainly have something else about them that makes them stand out from the rest. Their driving force is great, too, and I really admire this about them... they intrigue me, that's for sure. If they didn't, then I certainly would not be profiling them right now, and hoping to get their name out at least a little bit more! So, that all said and done, let's take a look at the members of Starmarie, shall we? Please be sure to tell me who your favourite is! Other: She was a model for Pichi Lemon. In the past, she was under Stardust Promotion as a part of Tambourine Artists. She is from the original lineup of Starmarie. She shares the same name as SKE48 Research Student Aoki Shiori. Other: Played Badmington, Volleyball and Rollerblades. For a while now, Starmarie have been around. They have lost two members along the way, however the girls have been standing strong as a 3nin unit ever since 2010 and seem to continue growing in personality and talent. 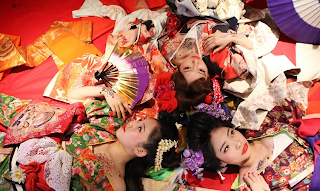 They seem to making their presence more and more known now, and really, who can blame these girls for breaking out and making themselves present, not only in Japan, but now America as well? They are a talented group of girls with charisma, personality and beauty, and they deserve to be known now! Personally, this group has become more and more interesting to me now that I have researched and taken a good look at their history; they are different in a way, they have a certain impact and a charisma that I quite like. Some of the songs that I have listened to by them are also quite nice, and also... I love that they all look like beautiful dolls! This group is definitely one that everyone should look out for, because whilst they may still be unknown to some, these girls are Gems in the making, and it seems that their management really know how to promote and sell them... so please, be sure to check them out if you haven'y yet!